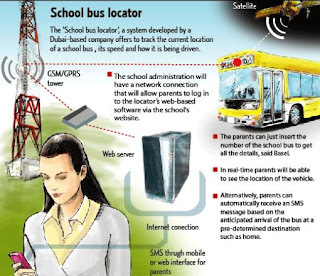 After the death of a 4-year old left behind in a school bus in Abu Dhabi, 2 software companies have developed software to help track the school bus and to inform the parents by SMS once the child reaches the school. Read the full Gulf News article here. Great idea! I hope the RTA also implements such a display board at all bus stops to let us know exactly at which stops the buses are on and how long it would take to reach this particular stop. Software companies, are you listening?